Everest, in all its intensity and boredom, to me often feels like a stimulant-enhanced version of “normal” life at home. This heightened intensity of emotional and physical existence is not necessarily a good thing, but I am sure this is why many of us return year after year. It is an addictive way to exist. Did you change your client experience requirements based on your 45 day program? First Summits of Alpenglow’s 2012 Ama Season! Monica checked in with the following great news! 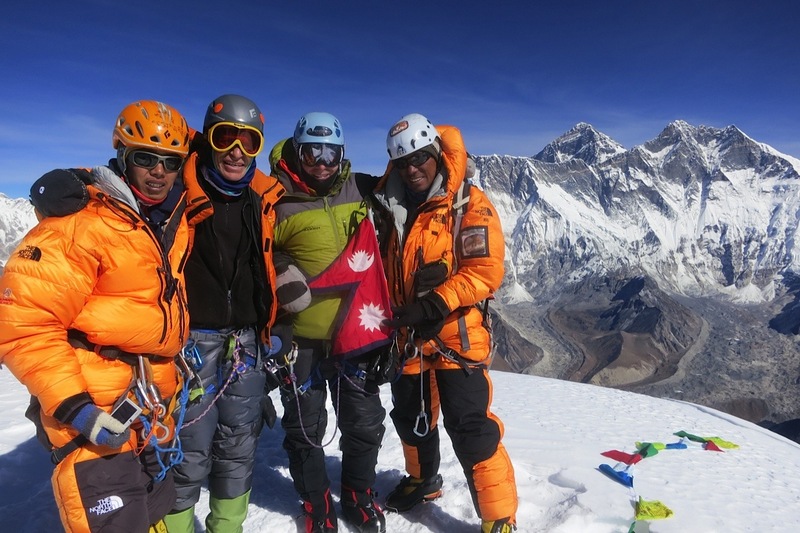 The first crew summitted this morning (Fri, 26 Oct.) between 0738 and 0847 Nepal time. Heather, Valdis, Sergey and Chad from C2.7 and Adrian from C1. Dorji, Da Nuru and Palden went with them. Everything went really well and the great conditions meant that they all had fast times from camp to summit. Now they are well below high camp on their way down and I expect to see some, if not all of them in base camp this evening. Adrian will stay with Ephi at camp 1. Everest and Lhotse Expeditions 2013! Many people have been waiting to hear from Alpenglow about our spring plans on Everest and Lhotse. First, thank you for considering us for your Himalayan climbing plans. After fifteen years in Nepal running successful expeditions on the lesser peaks (9x Ama Dablam, 1x Pumori, 7x Island Peak, 9x Lobuche Peak, and many others) along with five years as Himalayan Experience’s lead guide (4x Everest, 4x Manaslu, 1x Lhotse, 1x Cho Oyu), I am extremely excited to be running our own teams on Everest and Lhotse.